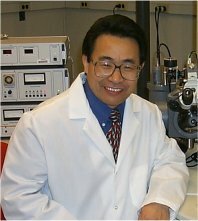 To help replace fossil fuels with environmentally friendly, economically viable power sources, Dr. Jimmy Liu and his University of Missouri colleagues are building nanostructured catalysts, devices no larger than a few dozen atoms, to harvest and store renewable energy. Liu came to Pacific Northwest National Laboratory as part of the Frontiers in Sciences Seminar Series to discuss building catalysts and other materials for energy. He also discussed the requisite advances in chemical imaging. The seminars allow experts to share new ideas and new research with their colleagues at the national laboratory. Liu and his team from the Center for Nanoscience devised ways to control nucleation to get the desired nanostructures for different applications. For example, the team created metal nanocrystals and used them to "mine" the common pollutant carbon monoxide for its central carbon atom, which can be subsequently used to build fuels. This is just one example of the team's work, which includes nanoparticle systems for solar panels, sensors, and imaging agents. Because the configuration of the nanostructures affects the performance of the materials, scientists needed sharp images of the reactions as they were occurring. They turned to aberration-corrected scanning transmission electron microscopy and atomic-resolution environmental transmission electron microscopy. The microscopes provided sub-Ångström resolution images of reactions in situ. During the seminar, Liu showed examples of his team's microscopy experiments and how they were able to see atoms move across surfaces and form clusters or nanoparticles. The team combined the microscopy images with density functional theory calculations and modeling. The combination allowed the team to determine the behavior of nanostructures and understand the complex relationships between synthesis, structure and catalytic performance. "This talk provided an outstanding opportunity for our scientists—not only in imaging, but also in catalysis and materials—learn from one of the best," said Dr. Louis Terminello, Director of the Chemical Imaging Initiative at PNNL. Bio: Dr. Liu is a Professor in the Department of Physics & Astronomy and the Department of Chemistry & Biochemistry at the University of Missouri-St. Louis. He is also the Director of the Center for Nanoscience at the university. He received his B.Sc. Honors degree from University of Science and Technology Beijing, and his Ph.D. from Arizona State University. Before joining the University of Missouri -St. Louis in 2006, he was a Senior Science Fellow and Senior Research Manager at Monsanto Company.